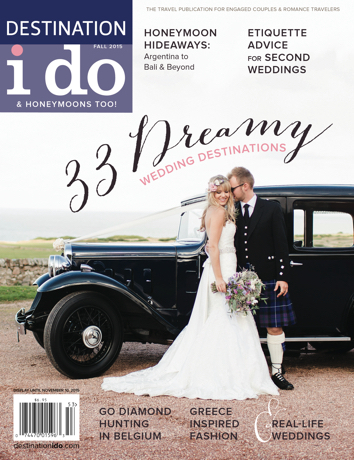 Our Fall 2015 cover features Real-Life Weddings’ couple Rachel and James who tied the knot in St. Andrews, Scotland. She is in a MoriLee gown and a floral crown and bouquet by Blue Poppy Florist. The groom has Scottish appeal in a kilt and jacket from McCalls Highlandwear. Annamarie Akins Photography captured this amazing shot. As always, we’ve scoured the globe for the latest and greatest destinations in which to celebrate one of the most important days of your life. 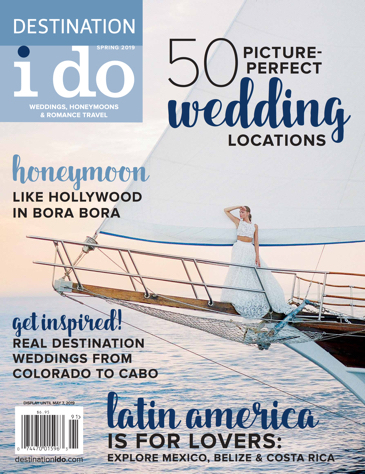 Discover places to say “I do” such as Thailand, Belgium, Africa, Mexico and British Columbia. Our Honeymoon Hideaways’ section contains features about French Polynesia, Rome, Argentina, Uruguay and Bali.